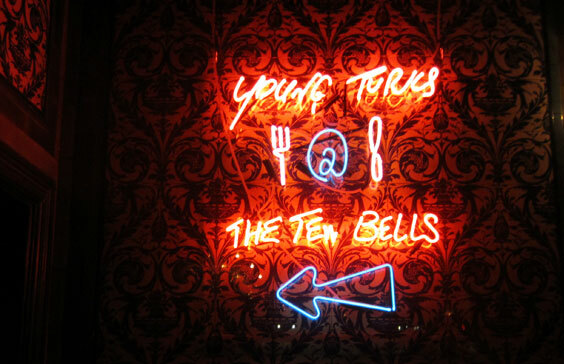 The famed Young Turks have popped up at The Ten Bells in Spitalfields and I really only have one thing to say – GO! In an intimate dining room above the newly renovated Ten Bells pub, four lads are serving a very sleek menu with innovative pairings and just simply stunning food. Residing only until the end of January you better get in now. The menu changes weekly so I am already planning my return. On arrival you are greeted with a Hendricks cocktail, we were treated to Hendricks with spiced quinces, which was quite uncanny as I had only been raving on about how much I love quinces! I guess they are in season! And the menu which followed was a veritable parade of seasonal British produce. The meal starts with a selection of bites. 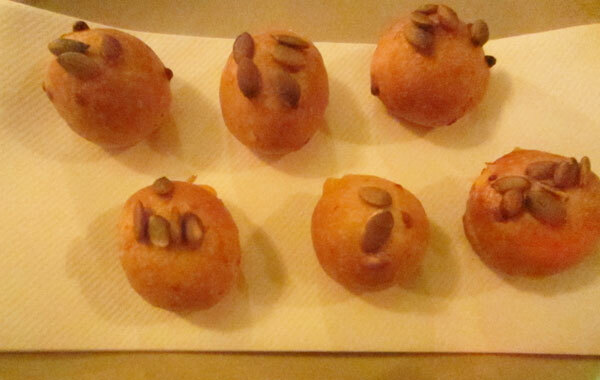 Little pumpkin and Ogleshield buns were delicate and tasty and snuffled in one mouthful! 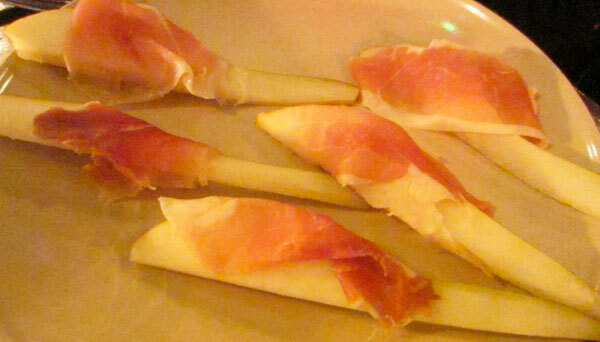 A sweet slither of perfectly ripe pear with a shaving of ham was a gorgeous match. And by the length of the slice it must have been one mighty big pear. 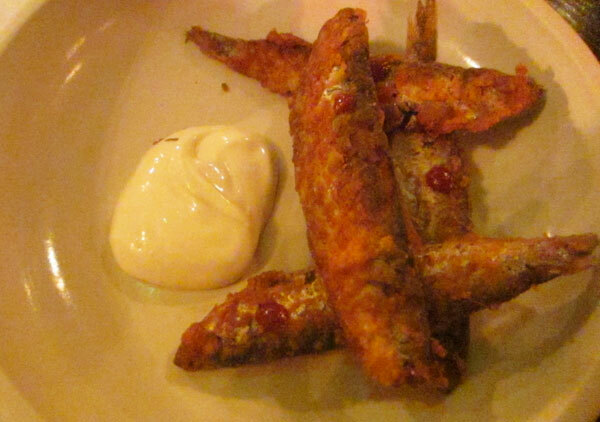 Devilled sprats were my pick of the small dishes. Crispy, with a little spice and a creamy mayo to accompany. Delish. 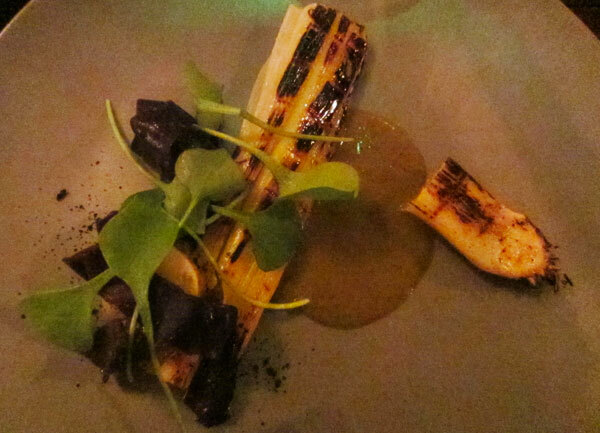 The larger dishes started with an intriguing serving of grilled leek with dried scallop and seaweed. Slightly charcoaled the leek was soft and buttery which contrasted perfectly with the chewy ribbons of seaweed. The scallop had us guessing – it was nowhere to be found on the plate yet we could distinctly taste it. A mystery, but a beautiful combination of flavours and texture. And grilling leeks is something I hadn’t thought of doing so will be giving that a go. The next dish won’t win any prizes for attractiveness but it tasted absolutely stunning. The creamy parsnip was textured with chewy oats and the pheasant was succulent and dripping in a rich gravy. 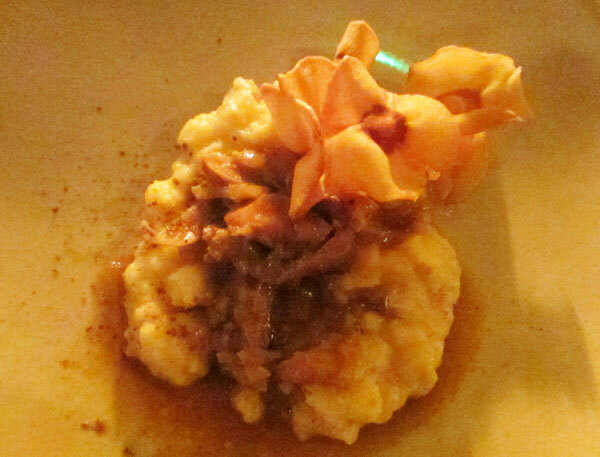 The crunchy parsnip crisps topped it off. Amazing. We were all anticipating the pork belly and I think it even exceeded expectations. Our mouths were watering as the plates reached the table. Perfect crackling encrusting a pink kissed piece of pork, slightly sweet from the molasses reduction, and then a bit of bite from the red radish completed a sensational mouthful. We were all licking the plate clean! Dessert was light and fluffy and full of flavour. 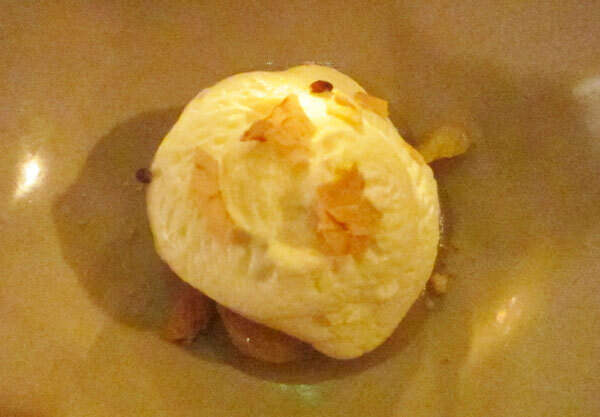 Spiced apples were covered in a whipped sour meringue which was so light it instantly dissolved in your mouth. It was quite refreshing not to face a heavy pudding after six courses which would have tipped us over the edge. Instead we were completely satisfied without being induced into a food coma. 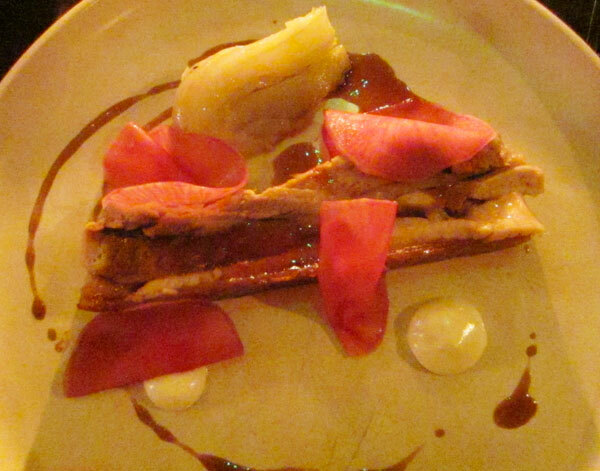 My photos really don’t do justice to what was such a sophisticated and deliciously composed menu. And for £39 per person it is absolutely worth it. The setting is intimate the service personal and the food stunning. I will definitely be returning to experience again the wonders of the Young Turks.